There has been no Brazilian world champion since Ayrton Senna in 1991, but the passion of the Brazilian fans continues regardless. The atmosphere is always electric at Interlagos and AT&T Williams driver Rubens Barrichello can expect a big following when he races in front of his home crowd. Interlagos is physically tough for the drivers. The anti-clockwise direction pulls on the neck muscles and its notorious bumps jolt every muscle in their backs. But the drivers still love it. At 800 metres above sea level, the track is the highest in F1 and that poses a few problems for the engines. The reduced atmospheric pressure causes a 10 percent reduction in power, which equates to 80bhp. Mark Gillan, Chief Operations Engineer: "As a team we need to have a quick turnaround between the Abu Dhabi test and Brazil. We are expecting mid-20˚C ambient and mid-30˚C track temperatures. There is also a chance of rain, which if it comes, tends to be heavy. The Interlagos track is a classical 'two circuits in one' layout, with set-up always being a compromise between the long uphill run from T12 to the start-finish line and the medium-low speed corners within Sector 2. Both fuel effect and consumption are low for this 71 lap race so the fuel mass is low at the start of the race relative to the majority of tracks during the season. We will have the medium and soft Pirelli tyres this weekend, as last used at the Abu Dhabi race. We will also have two sets of development dry tyres for Friday’s running." 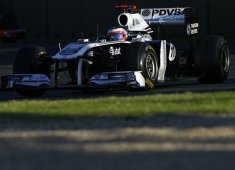 Rubens Barrichello: Brazil: "it’s the best week and race of the year for me. It always goes by so fast but I try to enjoy every little second of it. I love the racing track, especially the Laranjinha corner with it is double apexes. Interlagos has always been very good for overtaking and I expect nothing different this year. For a quick lap you need a combination of good brakes, good traction and good engine power. I am looking for a positive end to the season with a points finish." Pastor Maldonado: "It will be my first time racing in Brazil, although I have visited the country once before and loved it. It will be an interesting race for me because it is the closest one to my home country, so I hope to have lots of Venezuelan fans and support for me there. I really like the look of the Interlagos track and, having spent time driving it in the simulator, I think it is very fast and I am going to really enjoy it." The Interlagos circuit is all about altitude; at around 930mbar it is almost 10% lower than conditions experienced in Korea. The resultant drop in the density of air going into the engine equates to a similar drop in power output. The biggest test for the engine comes at the exit of turn 12 and the very steep climb which continues through turns 13 and 14, which are all flat in dry conditions. The power reduction makes this climb seem all the longer for the drivers. Drag is also reduced at altitude, which can help the engine and help combat the power loss. One relatively positive side-effect of the altitude is that the internal components of the engine that are loaded due to combustion will have an easier time in Brazil due the reduced cylinder pressures that accompany the low ambient pressures. Cosworth has positive memories from last year’s Brazilian Grand Prix thanks to the Cosworth-powered pole position with AT&T Williams and hopes for a positive points-scoring end to this season. Brazil is a very important event for us because it’s an historic venue and also a key market for Pirelli. During practice on Friday we’ll be trying out a new experimental hard tyre, and then for the race our P Zero Yellow soft tyre will also be a new compound, which was tried out during the recent young driver test. The other nominated tyre is the P Zero White medium, as used in the last Grand Prix at Abu Dhabi. The focus now is on next year so we will be very interested in hearing the feedback from the AT&T Williams drivers about our new tyres.